You can replace a section of the audio without needing to re-record the entire clip. Replace a section of audio when you make a mistake or need to remove an interruption in the recording. In the editor, select File > New Recording. Click Record and begin recording the new audio. 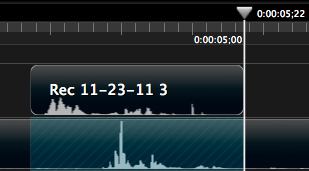 To view the screen video while recording audio, click the minimized Camtasia project in the dock. Click the Play button to play the video on the timeline while recording the new audio. 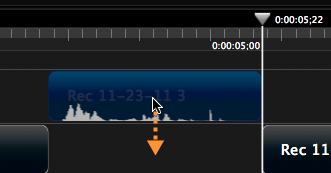 To trim the audio clip to only the portion you need, drag in the ends of the audio clip. Control-click on the original recording, and select Separate Video and Audio. Select the section of the original audio that you want to replace by holding Shift while dragging on the timeline. Drag the new audio clip into the space where the original audio was located.